Superbowl Fans, Hoist Your TV Lift Cabinets! This year, Super Bowl XLVIII is on February 2nd and will feature the Seattle Seahawks and Denver Broncos meeting in New York at MetLife stadium. Of course you’d prefer to be at the game itself, but as football fans, we’ve always felt that relaxing in your perfectly-designed den or lounge is the next best thing. There have been talks of rescheduling the game because of snow and cold weather, so the home-viewing route may start to look far more appealing as the day gets closer. Is your living room in top shape for the yearly festivities? Whether you’re celebrating a win or lamenting a loss, your lounge, den, or living room needs to be decked out with all of the necessities to make watching the game the great experience that it should be. We always recommend a TV lift cabinet or TV lift to maximize viewing angles, hide your TV when it’s not in use, and just to spice up the décor in your living space. Maybe it’s even time for a new TV (is that old one going to be impressive enough to your buddies?). If so, there’s no better time to upgrade your entertainment furniture with a TV lift. 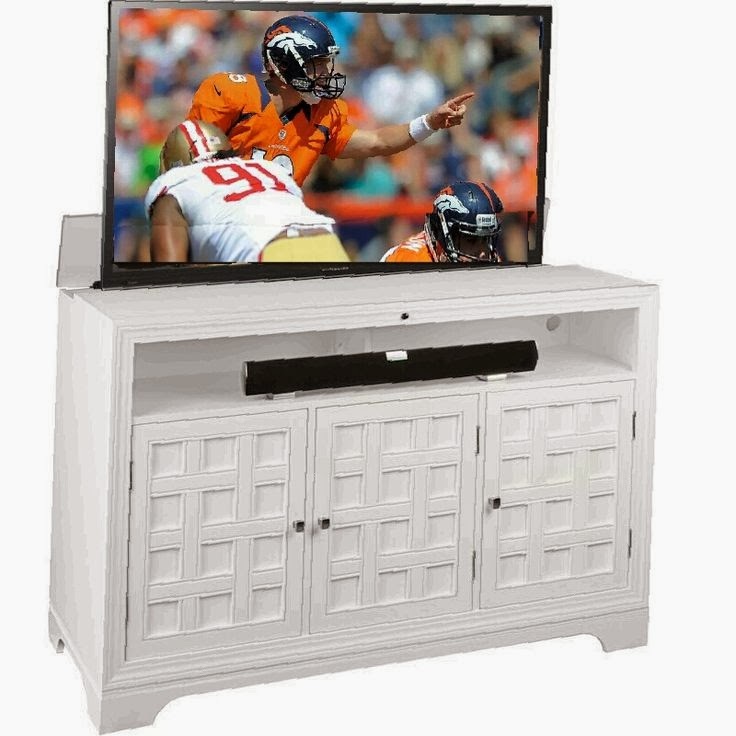 We can accommodate the vast majority of TV sizes, no matter how large, and offer custom cabinets for those. The Super Bowl is known as an entertainment holiday as well, not just for football fans. The NFL has done tremendous work the last few years to make the experience of watching the Super Bowl fun for the whole family. With the emphasis on entertaining commercials and exciting halftime shows, it’s great to have an entertainment space that accommodates the whole family. The halftime show this year will feature Bruno Mars and the Red Hot Chili Peppers, likely in an attempt to draw in a younger audience. Whoever you rout for, we are sure they will be impressed and entertained by your new tv lift cabinet!